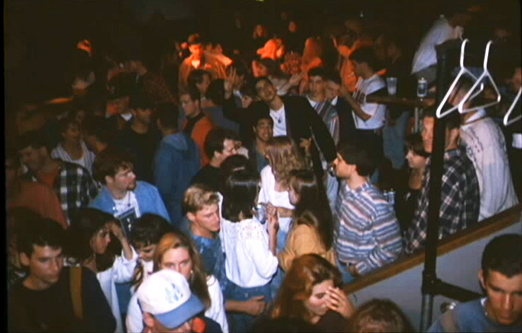 RADFORD - The wrecking ball did what college-boy rock bands, disco DJs and raging fraternity parties could not for more than 20 years. It really brought down the house at The Bus Stop. The old gray lady of Radford is as gone as Milli Vanilli. The consummate college hangout and dance club that entertained thousands of young people from Radford University and a few insurgents from that other nearby school for 22 years has been torn down. Faster than you can say "Funky Cold Medina," The Bus Stop was closed, sold, flattened and hauled away, ending a memorable, colorful chapter in the history of Radford University and the city of Radford. We shall not see its like again. Some people think that's a good thing. Those of us who attended Radford in the 1980s, though, might feel a bit differently. That moment of silence you don't hear is from us. The demolition of The Bus Stop is one more cold reminder that time breakdances on, and we're not happy about it. "It's been fun," said Ed Savage, who owned and operated The Bus Stop during its entire run. "Times change. I had a good time, but I doubt I'd do it again." The Bus Stop wasn't an immaculate nightspot. Most nights, it was loud, hot and crowded. The floor was often sticky with spilled beer. If you dared enter the men's room, you might witness horrors that would give you the shivers even 15 years later. Dance DJs spun, mixed and scratched stacks of wax - as a slide show of Bus Stop crowd shots flashed on the wall. "I remember one time, a guy and a girl were dancing and the girl looked up and saw the guy dancing with another girl in one of the slides,"Savage recalled. "She stepped back and slapped the guy." Yes, The Bus Stop probably led the New River Valley in two distinct categories: starting romantic relationships and ending them. You didn't have to push very far through the sweaty mob to see a lip-locked couple oblivious to the swirl and tumult or two young people in the final throes of a bad break-up. Good music wasn't always the primary mission of The Bus Stop, although local bands played there on occasion. Even last year you could enjoy local bands 63 Crayons and the National Trust in one of the best barroom shows you'll see anywhere. Mostly, The Bus Stop was known as a dance place. The DJs who worked The Bus Stop most often in the late '80s were a couple of white college boys who appropriately called themselves Generic Male. Their mix of dance-club tunes and progressive rock was a soundtrack for the day - Terence Trent D'Arby followed by "Wild Wild West" followed by "Melt With You" followed by Guns 'n Roses followed by "It's the End of the World as We Know It (and I Feel Fine)." And everybody did feel fine. If you couldn't get a girl to dance with you when The Cure's "Just Like Heaven" hit the speakers, you might as well call it a night, boy. It didn't help that a lot of young men from the neighboring repository of higher learning often forded the New River in vain efforts to take advantage of Radford's famous "ratio." It was believed that at Radford, a female-only school until the early '70s, there were two girls for every guy, a mathematical formula that never quite reasoned out properly. Then again,I never was that good at math. The late '90s weren't as kind to The Bus Stop. Local law enforcement, state and local government officials and university administration clamped down on college drinking. In the last seven or eight years, bars and restaurants such as the Alleghany Cafe, Hot Chilies, Bumpers and others shut down. Savage said he was pressured (he won't say by whom) to keep people under 21 years old out of The Bus Stop, even though they legally could be there as long as they didn't try to have a drink. That turned out to be last call for The Bus Stop. Certainly, college drinking is still prevalent, but Savage believes it has mostly moved underground, occurring at frat-house parties and basement keggers that are harder to control. "I think kids drink more now than they ever did," he said. "They've gone wild. There are no rules anymore." That's the sentiment of a veteran bar owner. Savage opened The Bus Stop in 1981, right after he graduated from Radford with a business degree and a wealth of music biz experience. As a student, he booked regional rockers Snuff, the Nighthawks and Robbin Thompson at the Disco Depot, a place many remember in its later incarnation as Sackett's. Savage had a history with The Bus Stop, back when it really was the bus stop. He caught a Greyhound to boot camp there in 1966, when he was scuffling though his first college try. He served in the Navy, then went to Radford on the GI Bill. A few years ago, he spruced up The Bus Stop and added a restaurant called The Crab House. Now that The Bus Stop is gone, he has moved the restaurant to Christiansburg, where he said business is much better than it was in Radford. The new place, called The Gables, is on Radford Road in the old place that housed Giovanni's. The university foundation bought The Bus Stop property and will convert it into a parking lot. Many of the places that made going to school at Radford University different than anywhere else are gone now. Where's a kid to go these days to dance and get smacked because his girl saw him smooching some other chick in a slide show? Thank goodness for BT's, Chancey's and Macado's. They're the final holdovers from the 1980s. The rest are gone, all gone. The places where one used to hear live music and dance-club DJs are deader than MC Hammer's career. Sackett's, Lucky's Upstairs and now The Bus Stop. Gone. "I have college students who work for me now and they don't know The Bus Stop," Savage said. "They have aunts and uncles who tell them about it. Nobody knows The Bus Stop now." Some of us do. Below are a few videos showing some of the photographs that were a part of the "slide show" that graced the inside front wall of the Bus Stop for many years (and Ralph mentions in the article above) - you may see somebody you recognize! To see a few more similar videos of Bus Stop patrons, please visit this link on Youtube.com!